Take on the great outdoors like never before with the RYOBI 18V ONE+ Camping Combo Kit. This combination of tools includes everything you’ll need to tackle any camping, boating, or other recreational activities. Each tool runs off the included 1.3Ah and 2.5Ah batteries. And to ensure you can keep them charged in the remotest parts of the country, this kit includes the handy In-Car Charger. Out in the outback, the ONE+ Chainsaw will help you prepare your firewood and keep your campsite clear of any branches that may cause problems. And as the sun sets, the Torch can keep your campsite lit until you pack in for the night. 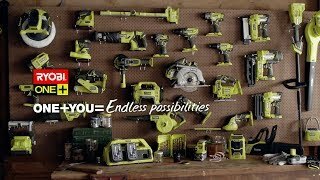 ith all the power and ease you could ever ask for, you’ll be ready for your next adventure with the RYOBI 18V ONE+ Camping Combo Kit. Grab yours from your local Bunnings Warehouse.